Your Tank is currently empty! (Important) Please Click HERE to double check our supplier's website for in-stock on your order to prevent delay. *All Fish, Inverts and Coral ship next day UPS from Atlanta, Ga.
*Your order may not look like photo shown due to variety and size within a species. 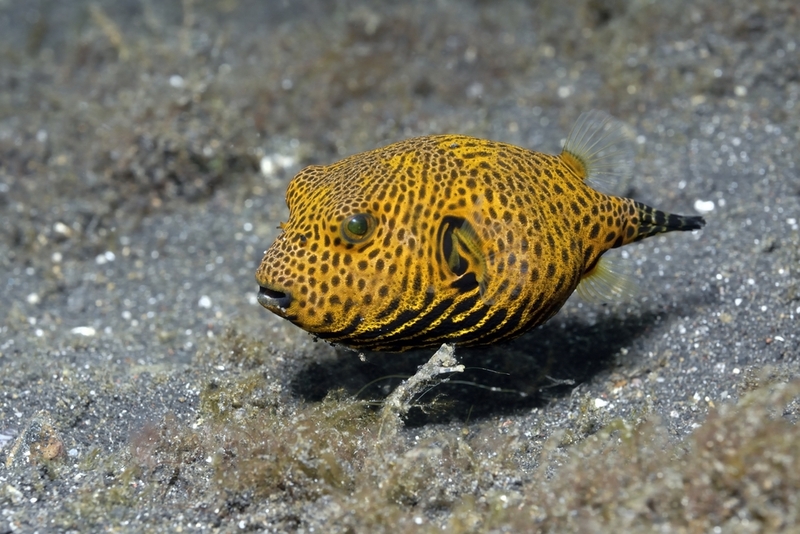 The Starry Puffer or Stellate Puffer has a striking orange colored body with a black tiger-like pattern. This puffer can grow very large and will attract immediate attention in a focal aquarium setting. Have plenty of live rock for hiding areas. Puffers will eat smaller fish and invertebrates in the tank. Never use a net to transfer a puffer. Feed a variety of meaty foods. Pufferfish really go for squid and clams. Train your puffer to eat Ocean Nutrition Formula One Pellets for extra nutrition. Copyright © 2016, MarinefishEZ.com. 8920 Eves Road, Suite# 769173 Roswell Georgia 30076. All rights reserved.